The cow and calf were eating my birch and willow bushes in the backyard. They just stepped over the fence because the snow was so deep. This year the snow is twice as deep already! The top of one of the bird pens which you see in the background has collapsed from the heavy load. 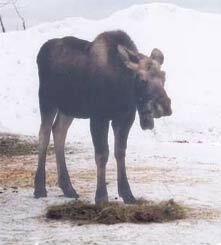 The feed store moose was spotted last winter at a store in Soldotna, Alaska. Supposedly if one feeds the animals then one will be arrested, but it was very hard to watch the animals starve and not give them a hand out. 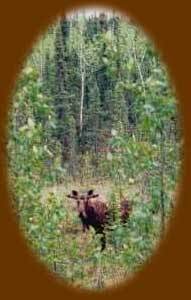 I See You - This was taken near Watson Lake on the Kenai Peninsula. There were three bulls walking along a creek in the early spring. Their antlers were just begining to grow. This one stopped and looked at me and thought that he was hidden. This cow and calf were spotted eating grass along the road side. 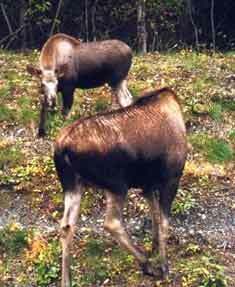 As you can see by the hair up on their backs they are not very happy moose. A person should always view cows with calves from their car if possible. There are two good reasons for this: one - the cow will probably charge and could kill you! Two: You will scare them and they will run into the highway or sometime in the case of very young calves they will become separated from their mothers. I am afraid the moose are going to suffer another very hard winter here. We have gotten between 5 and 7 feet of snow in the past week. The animals can't move around to find food and the food is buried. One thing about all this heavy, wet type snow is that it breaks off the birch trees or bends them down to the ground and then the moose can eat the tops of them. 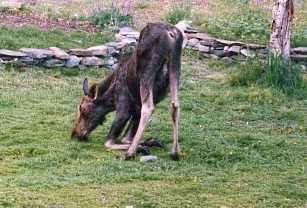 The lawn mower moose was an orphaned calf that ate everything he could in our yards, including all our gardens. Poor thing. The Summer Solstice Moose was spotted at the solstice festival in Moose Pass, Alaska. It is actually my oldest son inside the suit.